Environmental and behavioral influences on the comparative energetics of Anhingas, Double-crested Cormorants, and Flight..
v, 95 leaves : ill., maps ; 28 cm. by Willard W. Hennemann, III. stimulation of me shaped my maturation as a scientist. the study would never have been attempted. past, and for the support and encouragement given me. This research was funded by grants from Sigma Xi, the Frank M.
Chapman Memorial Fund, and NSF (# DEB 7906056). the cormorants observed "sunning" oriented with their backs to the sun. much of the incident radiation. metabolic rates, body temperatures, and thermal conductances at night. the differences in their geographic distributions. birds to fluctuating ambient temperature. conditions; that is, there may be no one function for this behavior. ture decline may be widespread among avian species (Irving 1955). in warm, humid environments such as Florida (Wunder 1979). reducing buoyancy and facilitating underwater prey capture. a wing drying or thermoregulatory function for spread-winged behavior. behavior with its cormorant relatives. the sun to assess the radiation levels available to sunning birds. between the frequency of certain behaviors and environmental conditions. water bath with a thermostat and a mercury and glass thermometer. meter (W/m ), (4) daytime with incident radiation = 700 W/m . satisfied (Christensen 1947, Heusner 1955), and VO2 had stabilized. V02/M is basal metabolic rate in cm O^/g h and M is mass in grams. minute, until the plumage was saturated. fluence of insolation both within and above the thermoneutral zone. techniques similar to those described in Lasiewski et al. (1966). of error in the calculation of EWL. analyzed for water content immediately after leaving the chamber. set of environmental conditions both within and between species. My field observations on Anhingas are summarized in Table 1.
rather than holding them steady (as was usually the case). behavior was observed (see text). Sunning refers to spread-winged behavior without accompanying preening. Sun & Preen refers to spread-winged behavior accompanied by preening. *Statistically significant difference (Test for the equality of two percentages, Sokal and Rohlf 1969). out when the sun was high, standing erect when the sun was low. negatively correlated with Ta (r = -0.83, p < 0.01, 9df). thereby exposing a minimum of surface. observations) was spent perching (preening, sunning, or just sitting). served behavior of cormorants on land (Table 3). cent of all individuals engaged in guiar flutter were facing the sun. was never accompanied by a spread-winged posture. behavior was invariably facing into the sun. posture was observed in dry individuals, often while tending the nest. during sunny conditions and at high ambient temperatures (Table 5, 6). aBehavioral Frequency = percent of total observations devoted to that particular class of behaviors. Behavioral categories are not mutually exclusive. c0ther includes interacting socially, arranging nest material, shaking off, walking, etc. (p > 0.05). Linear correlations between the duration of "sunning"
with r = -0.35 (p < 0.05). however, did vary with sky cover (Table 7). Table 7. Orientation of Flightless Cormorants under different sky conditions. to 43 minutes in length (average = 18.4 minutes). ing spread-winged behavior as opposed to after "sunning" (Table 8). (mean Tfa = 39.2C 0.32 SD). metabolism) at temperatures below thermoneutrality (McNab 1980). lower under incident radiation, especially in Anhingas (Table 10). significant (Table 10) reduction in slope under incident radiation. under control conditions for this.._species (Table 10). 1980) and erected back and wing feathers to expose areas of the back. by 12 to 12.5C (Table 10). trial without incident radiation (day or night) even when T = 45C. cormorant at night (Ta = 39C, = 41.8C). (450 W/m^) and 32C (700 W/m^) and increased in intensity as "T rose. and increased in intensity as T rose. is 144% of that measured in dry cormorants during the day. extend the upper half of the body out of the water. that suffered by land birds exposed to heavy rains (Kennedy 1970). behavior in Anhinga also has an overlapping thermoregulatory function. a radiant load was present. of radiant energy (Lustick 1980). high thermal conductance associated with wetting. a role in enhancing insolation absorption. behavior is not in any way associated with soaring. the water than do Anhingas. flutter, and only at high ambient temperatures and solar intensities. indicate foraging success (Jones 1978). during spread-winged behavior during my measurements. behavior. However, it is not a mechanism for gaining heat from the sun. conductance expected from Aschoff (1981). lation at 5C would amount to 166.33 kcal/day, a 22.41 kcal savings. to save 12% of the energy it would spend for thermoregulation at 5C. using the spread-winged posture, to be discussed below. aging strategy, one of active pursuit (Owre 1967). the energy budget of this species in many parts of its range. fectively white or black as the situation requires (Lustick 1980). (6) not engaging in spread-winged behavior. ambient temperatures than in Anhingas. species in hot, sunny environments such as Florida. Society Christmas censuses from 1977-1981, is presented in Figure 16.
frequencies appropriate for a sunny day, not a cloudy one (Table 13). 21%, possibly causing them to exceed the limits of their energy budget. average 10C, to compare costs with the Anhinga at this temperature. ambient temperatures far lower than the Anhinga can tolerate. these cormorants to extend well into the temperate zone. Bartholomew, G.A., R.C. Lasiewski, and E.C. Crawford, Jr. 1968.
owls, and doves. Condor 70:31-34. Cormorant Phalacrocorax capensis. Madoqua 9:5-55. Cade, T.M. 1973. Sun-bathing as a thermoregulatory aid in birds. and Double-crested Cormorant. Auk 90:324-340. Ciconiiformes, and Falconi formes. Auk 86:136-139.
metabolic rate of white-crowned sparrows. Condor 78:174-179. Edwards, A.L. 1954. Statistical methods for the behavioral sciences. Fry, C.H. 1957. Shag drying wings on water. British Birds 50:33. George, W.G., and C.L. Casler. 1972. Subalular apterium in birds. (AAAS Selected Symposium), R.D.K. Thomas and E.C. Olson, Eds. Westview Press, Boulder, Colorado, pp. 141-166.
and drying. 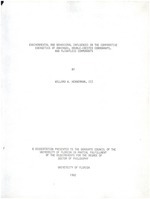 Ph.D. Thesis, Cornell University. Ithaca, Mew York. the function of black homeotherm pigmentation: An hypothesis. concerning black pigmentation. Science 158:1341.
in the turkey vulture. Auk 87:111-124. Heath, J.E. 1962. Temperature fluctuation in the Turkey Vulture. Anhingas in Florida. Condor (in press). Heppner, F.H. 1969. Bird feathers and radiation. Science 164:202.
de Benedict. C. r. Soc. Biol., Paris 149:2254-2257. Griffon Vultures, Gyps spp., and other large soaring birds. in the Reed Cormorant, Phalacrocorax africanus. Ibis 120:540-542.
in the Ciconiidae. Auk 88:715-722. Kennedy, R.J. 1970. Direct effects of rain on birds; A review. water in birds. Comp. Biochem. Physiol. 19:445-457. Lustick, S. 1969. Bird energetics! Effects of artificial radiation. Lustick, S. 1971. Plumage color and energetics. Condor 73:121-122.
tive heat load in birds. Science 208:1052-1053.
regulation: Orientation toward the sun in Herring Gulls. Cormorants. Ijx Proceedings of South African Seabird Symposium. Capetown Univ., Capetown, South Africa, in press. McAtee, W.C., and H.L. Stoddard. 1945. Wettable water birds. McNab, B.K. 1974. The energetics of endotherms. Ohio J. Sci. McNab, B.K. 1980. On estimating thermal conductance in endotherms. and Double-crested Cormorant. Amer. Ornithol. Union Ornithol. Yale Univ. Press, New Haven, Connecticut. sunbathing to molting in wild birds. Auk 91:537-563.
cormorants, Phalacrocoracidae. J. Exp. Biol. 48:185-189. Schoener, T.W. 1971. Theory of feeding strategies. Annu. Rev. Siegfried, W.R., A.J. Williams, P.G.H. Frost, and J.B. Kinahan. 1975. Plumage and ecology of cormorants. Zool. Afr. 10:183-192.
flightless cormorant Nannopterum harrissi. Ibis 108:265-287.
and radiative heat gain: A re-evaluation. J. Comp. Physiol.